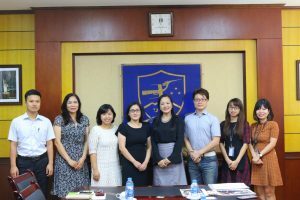 On September 21st 2018, the University of Languages and International Studies – Vietnam National University held a meeting with the representatives of the Framgia Inc from Japan in order to seek cooperation opportunities on internship programs. 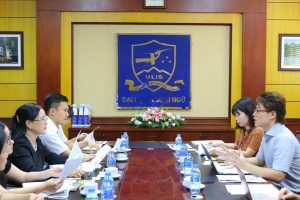 The welcome meeting was attended by Vice-President Mrs Ngo Minh Thuy, Mr Bui Dinh Thang, Deputy Head of the Cooperation & Development Office, Ms Nguyen Huyen Trang, Deputy Head of the Politics and Student Affairs Office, and some other associated staff. On the side of Framgia Inc, operational manager Mr Hiroaki Ishida and other representatives attended the meeting. 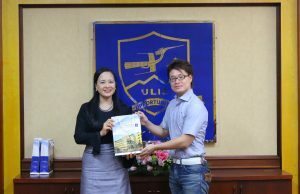 At the meeting, Mr Hiroaki Ishida thanked ULIS ​​- VNU for such thoughtful reception. He shared some prospective occupational areas in the internship program in which Framgia hoped to gain the cooperation from the University. He mentioned the benefits which the internship program would provide the students when participating in, such as: Interning and getting paid by Japanese standards, studying the Japanese culture and language, learning the working style, attitude and spirit of the Japanese, … He also promised to pay special attention to students participating in the program. Speaking at the meeting, Vice-President Ngo Minh Thuy sent greetings to representatives of Framgia Inc. She introduced ULIS and its Japanese teaching history as well as the Faculty of Japanese Language and Culture to the representatives of Framgia Inc. Ms Ngo Minh Thuy also shared about some internship programs in Japan had been running at ULIS for ULIS’s students. Also during the meeting, the two sides discussed matters relating to the internship program, especially to ensure the interests of the students participating in this program. The meeting was closed in anticipation of a potential cooperation of the two sides in the upcoming time.